Bha mi ag innse dhuibh mun bheul-aithris co-cheangailte ris a’ bhàrd ainmeil, Alasdair Mac Mhaighstir Alasdair – gur e ceud-chasach a thug air an dàn ainmeil Birlinn Chlann Raghnaill a sgrìobhadh. Bha e fo shlige bàta a bha bun-os-cionn ann an Canaigh. Nuair a chuala mi an stòiridh sin, bha mi a’ faireachdainn na bu thoilichte mun togalach ann an Dùn Èideann far a bheil Pàrlamaid na h-Alba stèidhichte. ’S e an t-ailtire Catalan, Enric Miralles nach maireann, a chruthaich am plana airson togalach na pàrlamaid. ’S iomadh rud a thug buaidh air Miralles nuair a thàinig e gu dealbhadh an togalaich – Suidhe Artair, a tha faisg air làimh, mar eisimpleir, agus beanntan garbha na h-Alba. Cuideachd, rudan mar ‘Am Ministear a’ Spèileadh’, an dealbh ainmeil le Henry Raeburn, a th’ air a riochdachadh anns na pannalan ri taobh nan uinneagan. Agus na bàtaichean bun-os-cionn a chithear air Eilean Lindisfarne. Tha iadsan air an riochdachadh ann am mullach pàirt dhen togalach. Mmm. Bha sin riamh car annasach dhomh. Bha Miralles ag ràdh gum biodh an togalach a’ riochdachadh fèin-aithne muinntir na h-Alba, agus aiseirigh phoilitigeach na dùthcha. Ach, aig an dearbh àm, thagh e ìomhaigh a bhuineadh do Shasainn, seach Alba. Ceart gu leòr, bha ceanglaichean làidir ann uaireigin eadar Lindisfarne agus an Eaglais Cheilteach ann an Alba, gu sònraichte Eilean Ì. Ach nach robh gu leòr de rudan ann an Alba fhèin a dh’obraicheadh air inntinn an ailtire, gun a bhith a’ dol a Shasainn airson ìomhaigh nan eathraichean bun-os-cionn, brèagha ’s ged a tha iad? 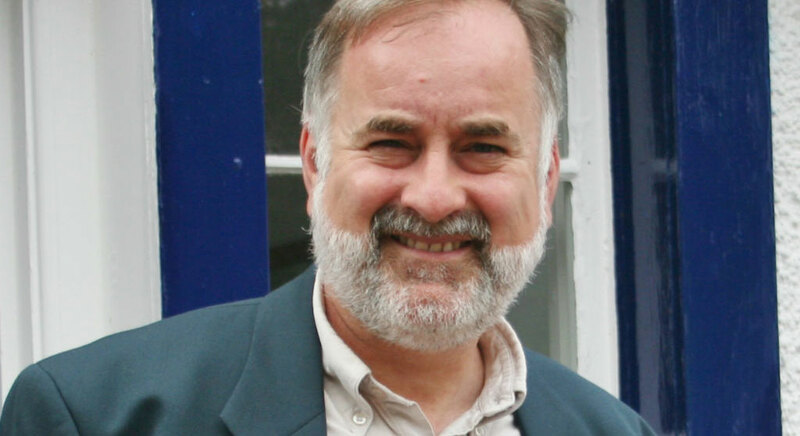 Ach, às dèidh dhomh an stòiridh mu Alasdair Mac Mhaighstir Alasdair a chluinntinn, bha mi a’ faireachdainn na bu chofhurtaile leis an ìomhaigh sin. Gu dearbh, tha ìomhaigh ùr agam a-nise nam cheann co-cheangailte ri togalach na pàrlamaid. Fon mhullach sin, a tha a’ coimhead coltach ri slige eathair, tha sinne an-diugh mar a bha Mac Mhaighstir Alasdair an uair sin. Tha sinn a’ lìonadh ar n-inntinn le smuaintean cruthachail, dìreach mar a bha am bàrd nuair a thòisich e air Birlinn Chlann Raghnaill a sgrìobhadh. Smuaintean Gàidhealach, gu dearbh! Tha mi an dòchas gun obraich sin gu maith buill na pàrlamaid! Agus chan e dàn sam bith a chruthaich am bàrd fon bhàta, ach Birlinn Chlann Raghnaill – mòr-sgeul filidheach a tha a’ riochdachadh, a rèir cuid, na strì aig na Gàidheil anns an ochdamh linn deug airson an neart is cumhachd fhaighinn air ais. An ann air fear-stiùiridh birlinn a-mhàin a bha Mac Mhaighstir Alasdair a-mach anns na rainn seo, no a bheil e a’ meòrachadh air a’ cheannas a tha a dhìth air Alba, agus spiorad ar-a-mach nan Seumasach a’ sìor lagachadh ann an cuimhne an t-sluaigh? Suidheadh air stiùir trom-laoch leathann, neartmhor fuasgailt’, nach tilg bun no bàrr na sùmaid fairge bhuaithe. Clàranach taiceil, làn spionnaidh, plocach, màsach, mìn-bheumanach, faicleach, furachail, làn nàistinn. Bunnsaidh, cudromach, garbh, socair, solta, lùthmhor, eirmseach, foighidneach, gun ghrìobhag ri uchd tùilinn. A bheil gin de ar ceannardan poilitigeach ann am Pàrlamaid na h-Alba a’ freagradh nam faclan sin?! Tha Mac Mhaighstir Alasdair cuideachd a’ dèanamh soilleir gur e an sgioba, ag obair còmhla, a thug an soitheach gu sàbhailteachd. Co-obrachadh. ’S dòcha gur e sin deagh ìomhaigh a bhith ann an sealladh luchd-poilitigs na h-Alba nuair a tha iad fo mhullach nan sligean eathair. Faclan na Litreach: ailtire: architect; nach maireann: deceased; Suidhe Artair: Arthur’s Seat; a’ spèileadh: skating; fèin-aithne: identity; Eilean Ì: Iona; eathraichean: boats; slige: hull; fear-stiùiridh: helmsman; rainn: verses; sgioba: crew; co-obrachadh: co-operation. Abairtean na Litreach: gur e ceud-chasach a thug air an dàn ainmeil X a sgrìobhadh: that it was a centipede that inspired him to write the famous poem X; fo shlige bàta a bha bun-os-cionn ann an Canaigh: under the hull of an upturned boat on Canna; bha mi a’ faireachdainn na bu thoilichte: I was feeling happier; nuair a thàinig e gu dealbhadh an togalaich: when it came to the building’s design; a th’ air a riochdachadh anns na pannalan: that is represented in the panels; aiseirigh phoilitigeach na dùthcha: the country’s political re-awakening; thagh e ìomhaigh a bhuineadh do Shasainn: he chose an image that belonged to England; a dh’obraicheadh air inntinn an ailtire: that would work on the architect’s mind; a’ lìonadh ar n-inntinn le smuaintean cruthachail: filling our mind[s] with creative thoughts; gu maith buill na pàrlamaid: to the benefit of the members of parliament; mòr-sgeul filidheach: a poetic epic; a’ meòrachadh air a’ cheannas a tha a dhìth air Alba: considering the leadership that Scotland needs; agus spiorad ar-a-mach nan Seumasach a’ sìor lagachadh ann an cuimhne an t-sluaigh: with the spirit of the Jacobite rebellion steadily weakening in the public memory; suidheadh air stiùir trom-laoch leathann, neartmhor fuasgailt’: at the helm there is a stout, serious, powerful and unconstrained warrior; nach tilg bun no bàrr na sùmaid fairge bhuaithe: who will not be thrown by the crests and troughs of the ocean’s billows; clàranach taiceil, làn spionnaidh, plocach, màsach, mìn-bheumanach, faicleach, furachail, làn nàistinn: a supportive boatman, full of energy, sturdy, broad-hipped, truly destructive, careful, watchful, full of vigilance; bunnsaidh, cudromach, garbh, socair, solta, lùthmhor, eirmseach, foighidneach: firm, serious, rugged, steady, jocose, vigorous, expert, patient; gun ghrìobhag ri uchd tùilinn: without timidity to the breast of a stormy sea. Gnàthas-cainnt na Litreach: brèagha ’s ged a tha iad: although they are beautiful.